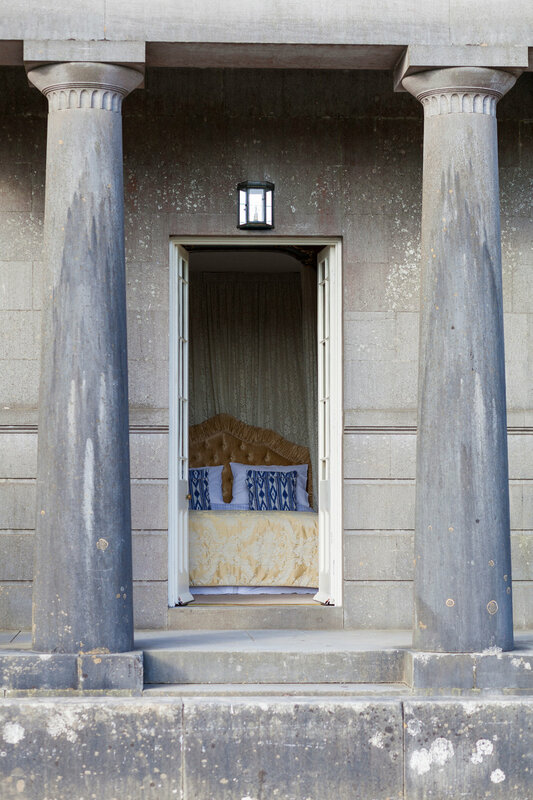 Loughcrew Lodge is a painstakingly restored gem of the Greek revival and one of the most unique rental accommodations in Ireland. Situated in a spectacular, storied corner of county Meath, it is the last standing example of architect C.R Cockerell’s work in the country. This is an utterly unique place to retreat from the rush and bustle of modern life. A stay at Loughcrew Lodge promises to be truly transporting, an opportunity to put the present on pause, luxuriate in the past and experience the embrace of antiquity. Retreat from the rush and bustle of modern life. 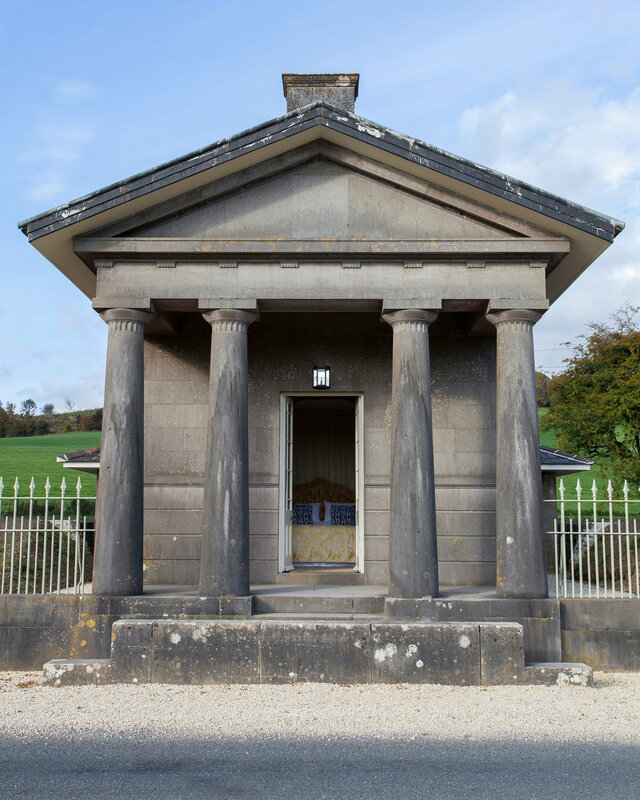 Loughcrew Lodge (built c.1820) with its splendid symmetry and Doric columns stands alone as the only complete C.R. Cockerell building standing in Ireland. The exaggerated high ceilings, large windows and glass front door allow the interior to be saturated with natural light. The Lodge has been painstakingly and faithfully restored, by antiquarian Niall Mullen, to the highest possible standard featuring a rotating selection of period furnishings (many of which are available for purchase). 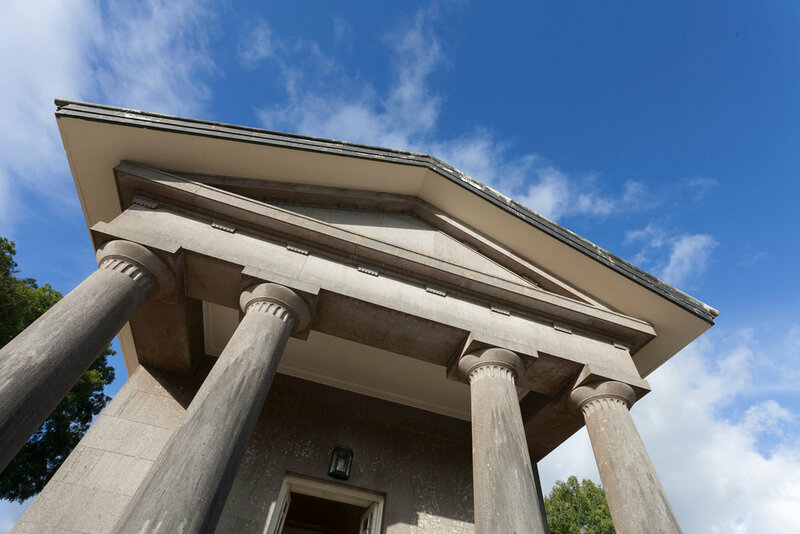 A stay at Loughcrew Lodge promises to be truly transporting, an opportunity to put the present on pause, luxuriate in the past and experience the embrace of antiquity. The cosy sitting room features a magnificent oil sea-scape, bringing drama to the space. A beautiful drop-side couch makes a great place for reading in front of the solid-fuel stove. A drop-leaf table and Chippendale chairs provide an elegant setting for dining. Run yourself a bath, lie back and enjoy some relaxation time in the lovely calming surrounds of the Lodge bathroom. Warm flag stones, tongue-and-groove panelling, natural light and thick, fluffy towels... it's a study in luxurious simplicity. The bijoux kitchen at the lodge has everything you will need to provided sustenance for your stay - equipped with appliances, cookware, crockery and flatware. You'll even find the basics in the cupboards - tea, coffee, milk and condiments. Situated in a spectacular corner of County Meath, at the very heart of Ireland’s Ancient East, Loughcrew Lodge sits in the shadow of Sliabh na Caillighe (The Hill of the Witches), the lodge perches on land shaped by forces of the Ice Age, surrounded by the remnants of settlements dating back to 3200BC. The hill features three Cairns, whose construction remains shrouded in mystery. One of these structures, Cairn ’T’, illuminates at dawn on the Spring and Autumn equinoxes. Click here to read more about the Loughcrew area. The Lodge is 5 km’s from Oldcastle, a beautiful typical Meath town of approx 2,000 people.